If you’re looking to light your fire, the habanero chili pepper lager, Hielo de Fuego, at Bell City Brewing Co. should do the trick. This in demand beer is usually a sell out. 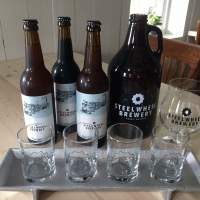 Steelwheel Brewery is Brant County’s first on-farm brewery. The owner operators grow a variety of hops on their 14-acre farm and serve it on premise in the taproom. Mash Paddle Brewing Co. celebrates each of its new beer releases with live music events and noshables from tacos to barbecue. The chocolate and orange porter at Bell City Brewing Co. isn’t the only match made in heaven that is a must-try. The Castaway Beach Orange Ginger Wheat Ale is crafted with summer in mind and fuses fresh ginger, orange zest and coriander to produce an intensely refreshing experience. Steelwheel Brewery adds forty pounds of this tropical fruit to make their dry hopped kettle sour, Steelwheel Mango Sour, producing a unique brew bursting with fresh flavour. 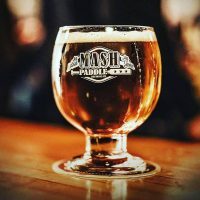 Mash Paddle Brewing Co. boasts almost perfect ratings in their long list of Google reviews from visitors, who rave about the “great beer”, ”friendly dudes” and “really cool vibe”. Like the sound of Black Liquorice Imperial Stout, Cap’n Crunch Ale, or French Toast Porter? Visit Bell City Brewing, where the list of interesting and unique brews is almost endless. Head to Steelwheel Brewery, where the outdoor patio of a century farmhouse is the perfect place to while away an afternoon in the countryside. Head to Brantford to try a few winning brews. At the 2018 Ontario Brewers Awards, Mash Paddle Brewing Co.’s The Trews’ North Strong won silver in the Herb/Spice Beer category. The bistro at Bell City Brewing matches a bacon-pepper grilled cheese “sammich” with their own Belgian Ale, and Yorkie Sliders — mini Yorkshire puddings stuffed with stout-braised beef and bacon with creamy avocado sauce — with their stout or IPA. 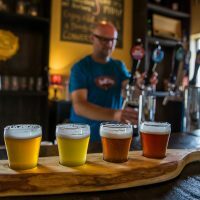 If you’re looking for more suggestions to find “true brews”, you’ll want to check out the True Brew Path, which will guide you along the road for touring and tasting at amazing craft breweries in Hamilton Halton Brant. The Ontario Greenbelt’s Brewery Discovery Routes are another curated selection of ‘must-sees’ from our full list of recommended stops. If you’re a thrifty taster, you will want to check out the Craft Beer Passport app to enjoy a $2 craft beer at selected stops. Planning to brew up a few days in the area? You may want to further explore Brantford and Brant County, an area that offers plenty of diversions to round out your tasting trip. True Brew Path Spotlight: Merit Brewing Co. Merit Brewing Co. in Downtown Hamilton is a brewery, kitchen, and bottle shop. Taste your way along the True Brew Path and discover the breweries, wineries and cideries of Hamilton Halton Brant. True Brew Path Spotlight: SHED Brewing Co. Discover Dundas-based Shawn & Ed Brewing Co.
Take a quick detour for ripe rural recreation big on fun and flavour!